The results shows are always so difficult and I like to keep my focus on the contestants rather than spend too much time fussing. I wanted this look to be fun and playful to take away from the difficulties of the results. Think outside the box with hair and accessories! Tonight's volumized loose waves show off under Christina's hip-hop cap. To achieve high volume IT&LY HAIRFASHION'S Pure Texture not only gives long-lasting hold but serves as a volumizing spray. Simply spritz the root area before adding the cap to create the foundation and finish with IT&LY'S Pure Definition Hair Spray Extra Strong for maximum hold that allows hair to move. Result? Volume...Waves...and a fashion tribute to hip-hop...ultra HOT! For Tonight's look, Christina was super focused on what the results of the show were going to be and how her team was going to do. She didn't want to be in something too fussy, she wanted to be cute and comfortable. Christina is wearing a Kenzo cap, Generation Love tie dye top, a vest by Current Elliot, AG jean shorts, Wolford tights, and Alexander McQueen boots. Her jewelry is by Loree Rodkin! 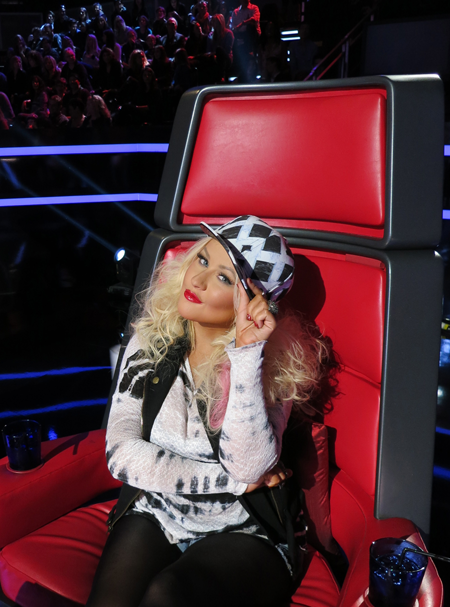 Last night xtina wanted a comfortable low key look because she gets emotional elimination days. I used a taupe eye shadow from il Makiage and a gold eyeshadow by matesse. Some Anastasia medium ash brow pencil a thick lash and her signature red lip to create a soft look that popped! It was a kind of B girl vibe.